For several months Kyle Ward (In The Groove 2, Re-Rave) has been teasing a new dance game over Facebook Live, initially showing very little detail about the game and slowly introducing new things in each subsequent livestream. 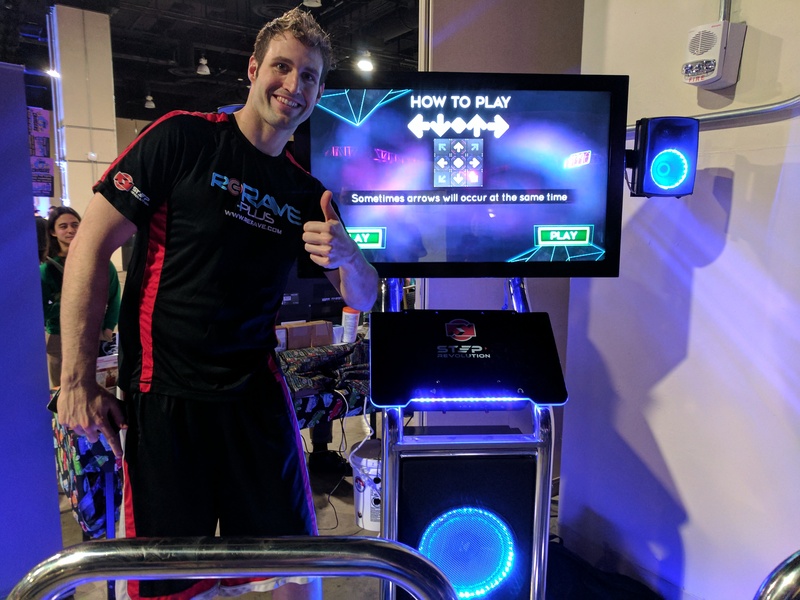 What he has shown so far are brand new panels that use different activation technology from the traditional DDR/ITG/PIU stages, a game that plays with five panels (supports up to nine), the pads connect to the REVO Touch Screen KIOSK Cabinet, and small bits of what the game looks like. Not only did this new game finally show up at MAGFest, everybody attending got a chance to try it out. This new game is called “StepManiaX” (pronounced Step Maniacs). Of course, we had a ton of questions for Kyle regarding his new game and the pad hardware. However, the community is mainly interested in the pads and how they work. Kyle was gracious enough to explain how the new panel tech worked and what it means for the players. The sensors use some sort of pressure-sensitive technology similar to what is used in bathroom scales, and both the pressure required for activation and the location of where the sensors can be activated are adjustable. 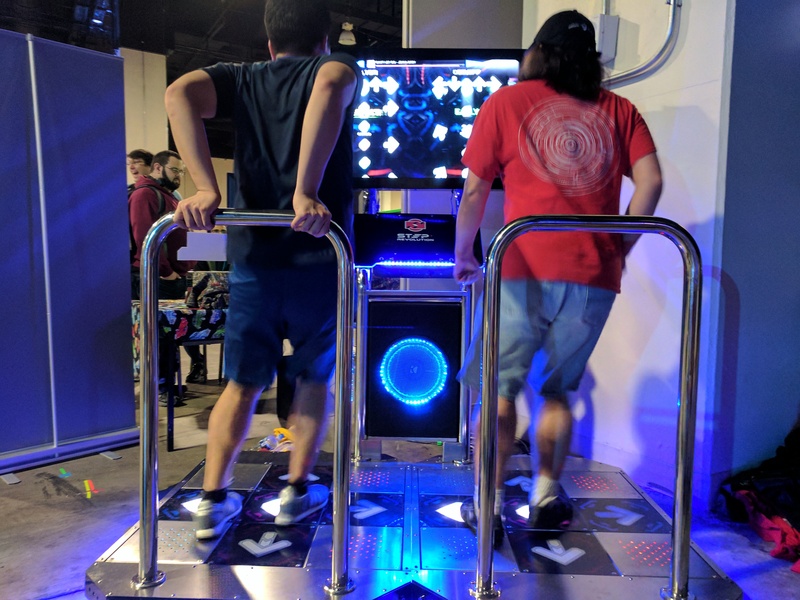 Not only are each of these panels are part of the StepManiaX dance stage, they can act as drop-in replacements for both In The Groove and DDR panels. Plus, they feel great to play on. Kyle demonstrating the sensor technology in a single panel. The game’s stage uses a five-panel layout that is essentially like DDR’s with an additional center panel. The arrow targets are arranged in the same way, but with a circle note in between the Down and Up arrows. The center note appeared to be much smaller than the rest of the arrows, but Kyle explained that the reason it was so small was because he did not want to make it too difficult for players coming from other four-panel games to read the notes, as a wider gap between the Down and Up arrows might have been more jarring. What I also noticed while playing was that I was very close to the screen. That is because the stage is connected to the cabinet itself. It is possible to disconnect the stage from the cabinet to increase the distance. The bars on the stage were very tall and wide. Much taller than DDR bars, which may be more comfortable to those who are used to playing on In The Groove dedicated cabinets. The screen on the cabinet is a touchscreen, so the entire game’s menu and interface is navigated by touching and sliding your fingers across the screen for scrolling through songs and selecting options. The interface is very clean and gives a very 80’s Retro Wave feel to it. There are 80 songs of a wide variety of genres, some old familiar tracks from In The Groove and popular custom charts, and a lot of new catchy and energetic songs. With four modes of difficulty (Basic, Easy, Hard, Wild) and tons of options that affect speed, note skin, lane effects, and many others, the game is already loaded with content. More comprehensive coverage about the game can be found over at bemanistyle. 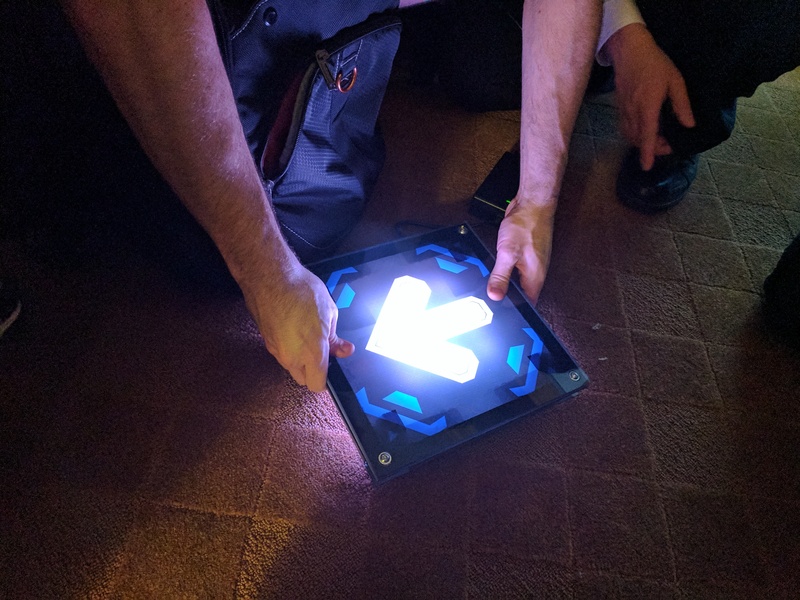 StepManiaX is still being tested. If you had a chance to play it at MAGFest, please give Step Revolution your valuable feedback. Be sure to check out the gameplay and some of the song selection in the video below.